The latest and greatest Dress Me Dearly Shopping Party is next Sunday, September 30th and you're all invited! There is nothing I love more than meeting my readers in person - well, except for maybe shopping. So really this is the best of both worlds. 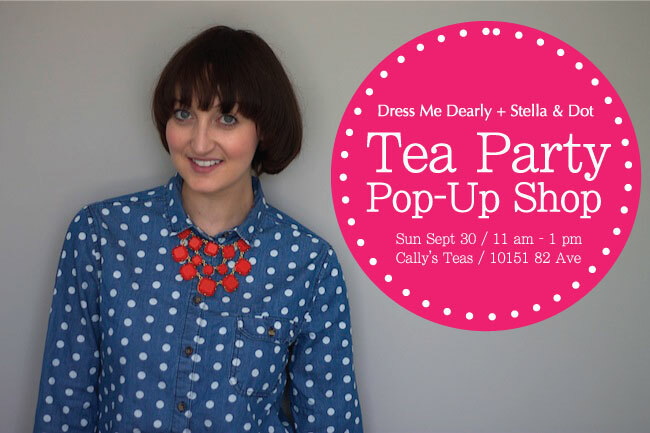 I'm thrilled to be partnering with Stella & Dot's Edmonton Stylist, Callie Derksen, for a Tea Party themed Pop-Up Shop! We'll be hosting the event at Cally's Teas on Edmonton's Whyte Avenue. The event will have tons of jewelry for you to shop and try on, delectable treats and I'll be offering up jewelry styling tips! Plus Cally's Teas is offering 10% off teas and tea-ware, so you can continue the Tea Party at home! I hope you'll join us to see all the new items from Stella & Dot, including my picks for must-have fall statement pieces. Also, if you RSVP by this Wednesday, September 26th to Callie_Dee@hotmail.com you will be entered to win a limited-edition piece designed by London designer Alice Temperly for Stella & Dot. I've seen some sneak peeks of the collection and it's aaaamazing. You'll also win a one-on-one style consultation with me! Can't wait to see you all there. 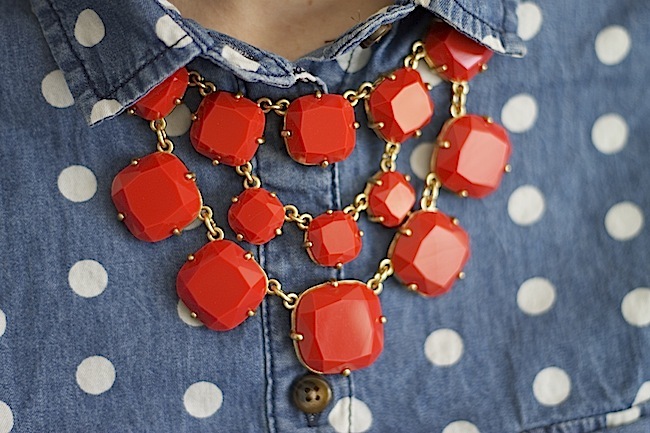 Outfit: Olivia Bib Necklace, Stella & Dot. Shirt, Urban Outfitters. 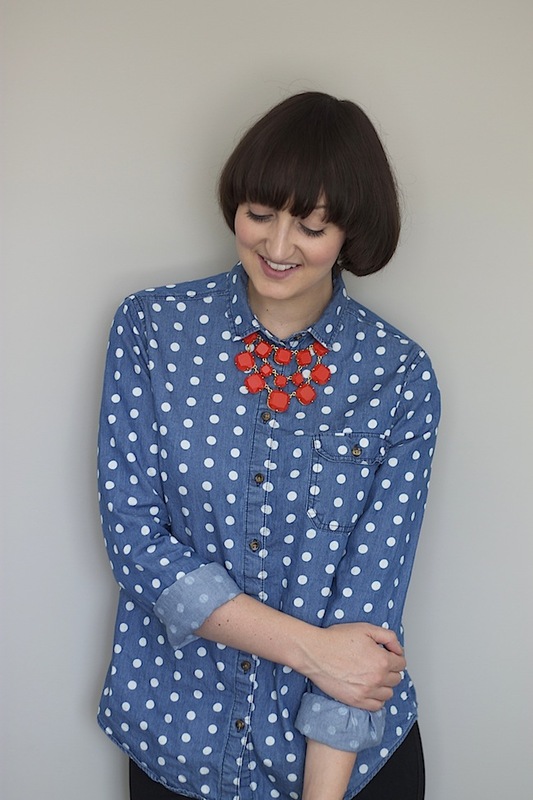 LOVE this polka dot denim top and that necklace is stunning. 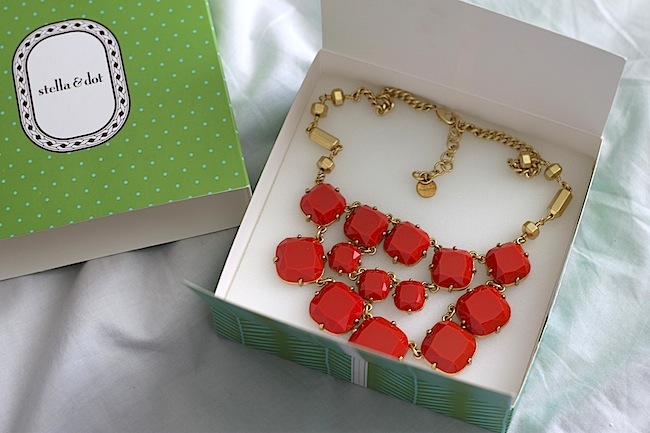 Stella and dot always have such amazing things!! Your necklace is just perfect !!!! love it !!! !